Published since 1937, RURAL SOCIOLOGY reaches an international audience of social scientists, policy makers, and agency professionals concerned with rural people, places, and problems. A forum for cutting-edge research, Rural Sociology explores sociological and interdisciplinary approaches to emerging social issues and new approaches to recurring social issues affecting rural people and places. The Rural Studies Series features books on a wide range of topics related to rural social issues. Of special interest are studies examining community and rural social organization, the social dimensions of agriculture, rural populations and economies, natural resources and the environment, and rural poverty and livelihood strategies. Rural Realities is a quarterly publication of the Rural Sociological Society (RSS). Its purpose is to : (1) Provide valuable insights on the current and emerging issues impacting people and places in rural American and beyond; and (2) Offer policy and program options that might prove effective in addressing these important rural challenges and opportunities. Articles showcased in the series draw upon high quality social sciences-based studies conducted by researchers and practitioners located within universities/colleges, government, philanthropic, and nonprofit organizations. For more information about Rural Realities, please contact the series editor. Formerly published quarterly, The Rural Sociologist, published announcements, articles, commentary and letters that were relevant to concerns of the Society. 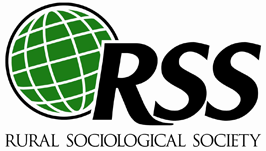 The Rural Sociologist ceased publication in 2012. RSS moved to electronic format and we are using the eBulletin as a vehicle for sharing Society news and important information. The RSS eBulletin is a monthly newsletter home to announcements pertaining to RSS, Meetings of interests, Annual Meeting news, Call for Papers, and other announcements worth sharing with our RSS members. Click the title to see archives of previous eBulletins.